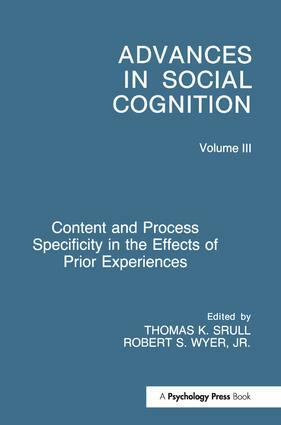 In Volume 3, Eliot R. Smith of Purdue University proposes that social cognition theorists have placed excessive emphasis on the role of schemata, prototypes, and various other types of abstractions. This has affected both the methodologies they use and the type of theories they construct. What has not been adequately appreciated is the storage and retrieval of specific episodes, especially those with idiosyncratic features. This volume s designed as a required text for those studying personality, experimental and consumer psychology, cognitive science, and communications. "…an impressive, well-developed argument….will compel social cognition researchers to question the assumption that representations of categories are abstractions….Srull and Wyer are to be applauded for their innovative approach to editing volumes of work. The format of target, commentary, and response provides the reader with a coherent package - something every book should do!" Contents: E.R. Smith, Content and Process Specificity in the Effects of Prior Experiences. L.W. Barsalou, On the Indistinguishability of Exemplar Memory and Abstraction in Category Representation. J.N. Bassili, Cognitive Signatures and Their Forgery. D.L. Hamilton, D.M. Mackie, Specificity and Generality in the Nature and Use of Stereotypes. L.J. Jacoby, M.J. Marriott, J.G. Collins, The Specifics of Memory and Cognition. C.M. Judd, Specific Encoding Yet Abstract Retrieval of Social Categories. S.B. Klein, J. Loftus, The Role of Abstract and Exemplar-Based Knowledge in Self-Judgments: Implications for a Cognitive Model of the Self. G.D. Logan, Social Cognition Gets Specific. T.M. Ostrom, The Maturing of Social Cognition. T.K. Srull, R.S. Wyer, Jr., Content and Process Specificity: Where Do We Go from Here? E.R. Smith, Reply to Commentaries.